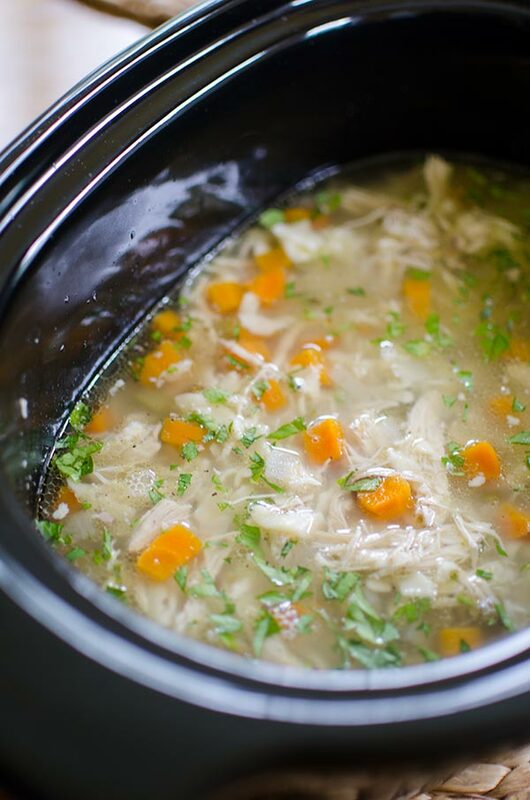 Slow cooker chicken noodle soup loaded with carrots, celery and onion and uses a whole chicken for a budget-friendly and simply soup recipe. Chicken noodle soup is without a doubt my favourite kind of soup, and the truth is that my mom makes the best chicken noodle soup in the world. When I was first thinking about this recipe, I knew that I wanted it to be just like hers, but I also wanted to try my hand at cooking it in the slow cooker. I’ve learned from my mom that the secret to a good chicken noodle soup is all in the broth. Please, please, please don’t use store bought broth for a homemade chicken noodle soup! Seeing as though this chicken noodle soup is made in the slow cooker, for this recipe you actually don’t have to worry about broth since the ingredients make their own flavourful broth as they cook away for hours. 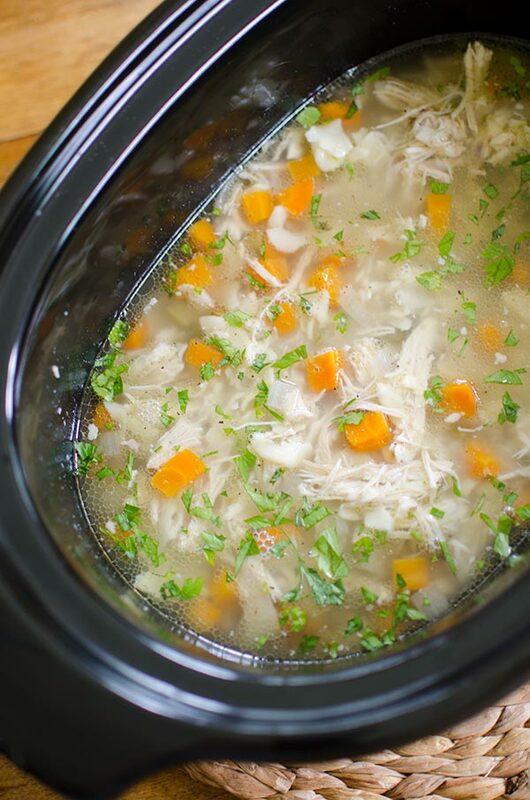 Now, the truth is that the idea for making slow cooker chicken noodle soup isn’t anything particularly revolutionary, but I wanted to try my hand at this method for making soup–after all, I love to make chicken broth in the slow cooker. For this recipe, I’m using a whole chicken. Many existing recipes call only for chicken breasts, but that makes this dish so much more expensive. Since the holidays, I’ve been trying to be a bit more budget-conscious, so this simple switch is the perfect way to keep costs down while still having delicious and nutritious meals. Well, I say that I’ve been trying to be more budget-conscious that is until I booked a last minute holiday to Jamaica! 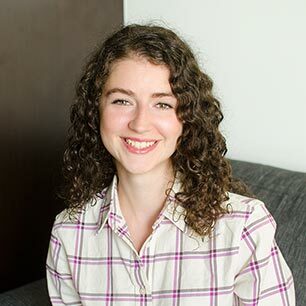 I’ve been working pretty hard since September, so I think I deserve a bit of a vacation, plus I’m in dire need of some sun and beach time and the timing just worked out. I’m feeling like this winter is starting to get to me (even though I feel like we’re still just at the beginning of it). Be sure to follow along on Instagram where I will definitely be sharing some snaps of my time away. Along with the whole chicken, I add the holy trifecta of carrots, celery and onion with our family recipes go-to aromatics; thyme and bay leaves. This is a dump and go crockpot recipe, you literally add all the ingredients to the slow cooker and set it on low, then add the noodles just before you’re ready to eat (they’ll cook up in no time). Combine carrot, celery, onion, garlic and lemon in slow cooker. Top with chicken, sprinkle all over with salt and dried thyme. Add bay leaf. Cover with water and cook on low for 8 hours. Carefully remove chicken from slow cooker (it will be very soft, and may fall apart), reserve. Discard lemon, garlic and bay leaf. Add noodles, cover and cook on high for 20 minutes. Meanwhile, shred chicken, discard all skin and carefully pick through for bones. Add chicken back to slow cooker and sprinkle with parsley to serve. Let me know if you give this slow cooker chicken noodle soup a try in the comments below. We tried this last night and it was absolutely amazing! Thursday's are busy days in out household so having it slow cook all day was perfect. We did make one minor alteration and used vermicelli noodles instead! They went really well with the shredded chicken. Thanks for the recipe!